A master of doing familiar things in unfamiliar ways, Guillaume exactly hits the spot once again with this loveably curious EP. After building Cascade in a frenzied hack night, we decided to put it up as an entry for Mozilla Game On. I wanted to learn about and showcase CSS3 animations. There were obviously a lot of 3D matrix transforms going in to the rotating cubes, but there were other subtler CSS3 animations across the website too. One effect that I wanted to achieve was to render the letter being played as if it were being written by hand. Line by line and exactly the way a human would draw the letters. I quickly realized that there isn’t going to be a straightforward way to do this. The animation had to be perfect and I wanted the text to be selectable afterwards so Flash and animated GIFs were out of the question. After brainstorming with neena we came up with a couple of solutions. SVG is just XML, right? So, if we just render the XML progressively we’ll have our animation! Err…NO! Life isn’t that simple, neither are the shapes of fonts. 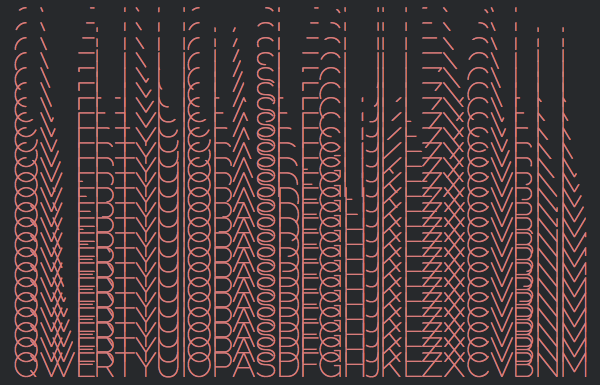 The SVG files of most fonts are pretty complex. They create shapes and subtract/add/intersect other shapes out of it. Get rid of one node in the curve and Latin will start looking like Devanagari. Not exactly what we want. 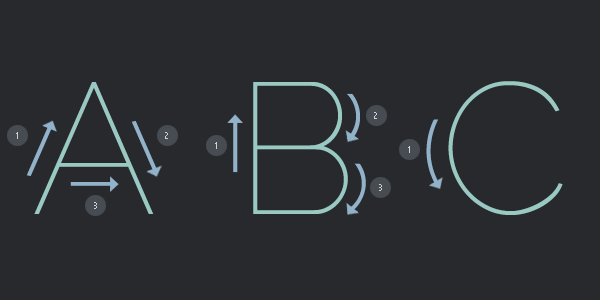 How about covering the letter with a DIV, that has multiple DIVs inside it, that have keyframe animations set in CSS that would slowly unmask parts of the character. We’d have to write at least 2-3 ‘unmaskers‘ for each character, not to mention that it would be next to impossible to do characters like X and Q where there is an overlap in lines. This is theoretically doable, but with the vast differences font rendering across browsers and operating systems it could never come out right. Let’s do the animation using arcs and lines in Canvas and once the animation is complete switch it out with a font that looks exactly like the one we drew on Canvas. So, all we need to do is design a font that can be made with simple arcs and lines, make animations for it in Canvas, convert it into a web fonts to be used as @font-face and we are done! This is starting to sound desperate. After failed attempts at achieving the effect, I suddenly realized that we have a typeface designer in the family. A simple solution came to my mind and I called Pooja (Didi) asking for a big favor. Frame-by-frame animation seemed like the correct choice for such animation so I asked Didi to make 24 different fonts each with one frame of the animation. We chose Raleway to begin with as it was simple, clean and easy to cut. New fonts can easily be added as long as someone is willing to cut all 24 frames of the 26 character by hand. Even though it sounds like a lot of work, the result I think was worth it. You can check out demos or look into the code and contribute more fonts. Wait a second! Was there an easier way to do this? brousch prtksxna: Turn on the GPS and peg the CPU? The Bartle Test of Gamer Psychology is a series of questions and an accompanying scoring formula that classifies players of multiplayer online games (including MUDs and MMORPGs) into categories based on their gaming preferences. The Superest was a continually running drawing game between illustrators Kevin Cornell and Matthew Sutter. A song journey through Swedish folk music played on electric organs and timbale, lullabies sung by wooden dolls, soundscapes in the place between time and space and long forgotten hymns. After publishing the Customizing iTerm2 post I was really bothered by the way the font was looking in the code block. Some people are more comfortable with anti-aliased fonts all the time, I personally can’t write or read code like that. I like looking at Monaco in 10pt without any anti-aliasing, just plain old pixels, so this was obviously bothering me. I did some poking around, asked Google, asked my sister but there seems to be no solution for it. Nothing that’ll work properly on every browser (why isn’t that surprising). There was something called font-smooth in the CSS3 specification in 2002 but they later removed it from the standard. MDN has a page on it only stating that they don’t implement it. There is however a purely webkit alternative called - webkit-font-smoothing that lets you do almost the same thing. I found a pretty extensive blog post about it which came with a demo page. I found some hacks to get fake anti-aliasing that were pretty interesting, but nothing to get rid of it. For now I’ll be happy with the following CSS and hope that font-smooth finds its way back to the CSS specification. Modern IDEs might be fancy 5-Start Hotels, but Emacs will always feels like home. You are currently browsing the Prateek Saxena blog archives for August, 2013.